Heat pumps are not that well known in the UK, however they can yield efficiencies of up to 400% in households and businesses, compared to some 90% with traditional gas boilers. Across Scandinavia and Germany, heat pump technology is widely used with over 90% installed in rural applications for the past 40 years. To encourage uptake of energy saving heat pump technology in this country, the Government have created the Renewable Heat Incentive (RHI) scheme. The RHI generates financial returns for investors in renewable heat pump technology. Consumers are paid for the renewable element of heat they generate. This means that you can not only save money on your energy bills but you can earn additional income to cover the costs of installation. We are able to perform a Green Deal Assessment on your property and help with your formal RHI application. 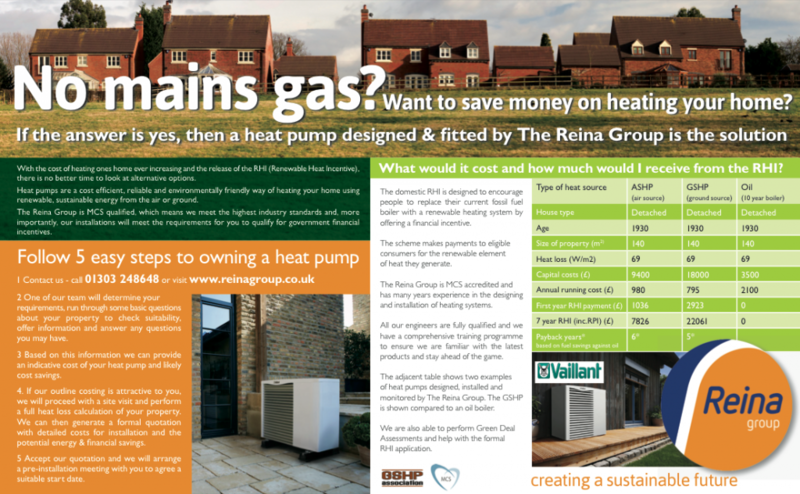 If you’re a homeowner, whose property has no mains gas, our heat pumps could save you thousands of pounds every year. On average, our domestic customers save up to £3,000 per year on their energy bills. Fuel poverty is becoming a growing issue in the UK, caused by steadily increasing price for fossil fuels (oil, LPG, coal), especially amongst those who live ‘off grid’. Our heat pumps work by drawing heat from the ground, water or air, which is not only a much greener option but it might be the only option in the years to come. They are cost efficient, reliable and environmentally friendly. Our energy saving heat pumps work using a similar process to a conventional refrigerator, but in reverse, offering lower emissions than typical fossil fuel boilers. The Reina Group’s design and installation service is accredited by the Microgeneration Certification Scheme (MCS). This assures each of our customers that our service is of the highest quality, it also gives consumers greater protection and eligibility for government grants. We are at the forefront of heat pump technology in the South East of the UK. As an independent company, we offer bespoke installation that best suits your property and your needs. Over the last few years, we have performed surveys and heat pump installation in over 250 heat pumps in homes ranging from a one-bedroom bungalow to a castle! If you’d like to know how much you could save on your energy bills, get in touch to arrange a survey.